If you’re thinking about a brand new home, we can help you imagine the possibilities! We’ve gathered everything you need to know before starting your new homes search – all in one place at LizMooreNewHomes.com! You’ll find information about new homes communities in Williamsburg and on the Virginia Peninsula – from River’s Bend at Uncles Neck to Westport to the Oaks at Fenton Mill – and everything in between! You can search new homes for sale in Williamsburg, Yorktown, Newport News, Hampton and surrounding areas, and learn about new home and model open houses that will be open for touring in the coming weeks. Browse floor plans and elevations in our custom floor plan gallery, and learn about local new home builders with their online profiles. Read articles about building a new home, and be sure to check out Liz’s Pick of the Week, where Liz Moore will post reviews of the latest trends and products in homebuilding. Inspiration Starts Here! 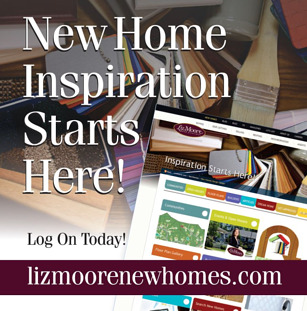 Visit LizMooreNewHomes.com today!